All color services are now offered with BR A Z I L I A N B O N D B U I L D E R ( B 3 ) . For stronger hair, and better color retention, choose the color service with B3! ​ I highly recommend this amazing product! Color services lift the cuticle layers, B3 reinforces and builds the bonds responsible for sealing those cuticle layers back together. You will see and feel remarkably healthier hair with longer lasting vibrant color when B3 is used. Choose to make your hair healthier with every color service! ​You can expect 1-3 inches of regrowth to be colored during this service. A retouch color is a commitment you make once you have your hair colored, and Hairstyles by Jess can help you maintain that beautiful color for as long as possible! Retouch color is one of our most popular services, for obvious reasons. We recommend you schedule your retouch color appointments every 3-6 weeks to maintain beautiful color. Add B3 for longer lasting results! All-over color is the quickest, easiest way to change your hair color. It’s a single-process hair color, meaning that we’ll apply a single shade (you guessed it) all over your hair. Using all-over color, you can subtly lighten or darken your natural shade or try a brand-new look, such as red or blonde. Add B3 for enhanced S H I N E ! R A I N B O W H A i R ! ​At Hairstyles by Jess, we love helping our clients find their perfect look. Sometimes that’s an earthy brown or a deep auburn. But sometimes its something more B O L D, it’s a hot pink Mohawk or mermaid highlights! When you want a fun, unique color, Hairstyles by Jess is the place to go! We have so much fun working with clients who what to walk on the wild side! In our opinion, there's nothing too creative! We’ve done many interesting color combinations at our clients’ requests, and we can do the same for you! Whether it’s pink highlights for breast cancer awareness, Silver locks, or teal streaks underneath because it matches your prom dress, we can give you exactly what you’re looking for! Any color of the RAINBOW is possible, or multiple colors, whatever you can imagine! Just adding a streak or two of a fun and unique color can really frame your face. Colored tips are eye-catching, but they’re low risk since you can be done with them in a couple of trims. No additional color required or commitment! 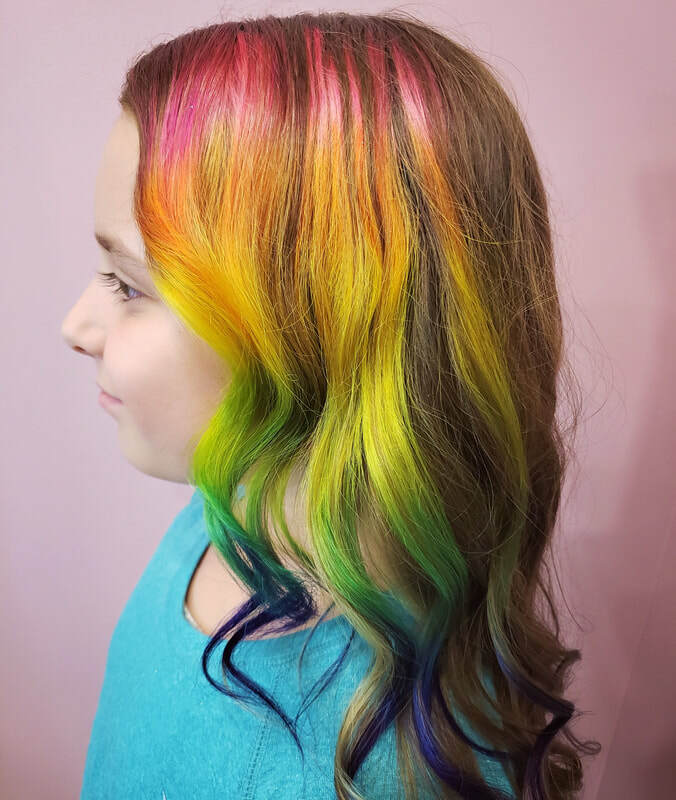 We also have clients who opt for fun, unique all-over color. Hairstyles by Jess can give you a single color all over (think deep blue, mint green, silver, neon yellow or rose gold!) These all-over colors are fairly easy to apply and retouch. We can also add multiple colors for a one-of-a-kind look. Rainbow highlights in platinum hair or lilac purple in gray tresses will make a statement wherever you go! Trust Hairstyles by Jess for your next bold hair color choice. We use the safest products and processes to color your hair no matter what shade you choose! ​Please contact us to consult before booking your next fun and unique color!! When booking online please indicate in the notes what color(s) you have in mind and be sure to use photos! Also, please note; often when doing rainbow hair colors a discoloration process is required meaning lightener will be used on the hair. The possibilities are endless when it comes to using rainbow colors in your hair!! Check us out on Instagram for the latest!